This 84-page, spiral-bound, 9 x 5.5-inch cookbook includes 60 recipes and 10 menus that are delicious, nutritious, low-cost, and easy to prepare. Most of the ingredients likely are already on your pantry shelves. Nutrition facts are included for all recipes, as is the cost per serving. Many recipes are "kid-friendly". 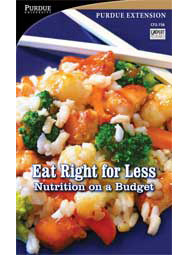 Any nutrition-minded cook on a budget will consider this a treasure. This book is also available in a Spanish-language version and in boxes of 100.